Come out and watch a recorded talk from the American Public Health Association’s most recent expo! 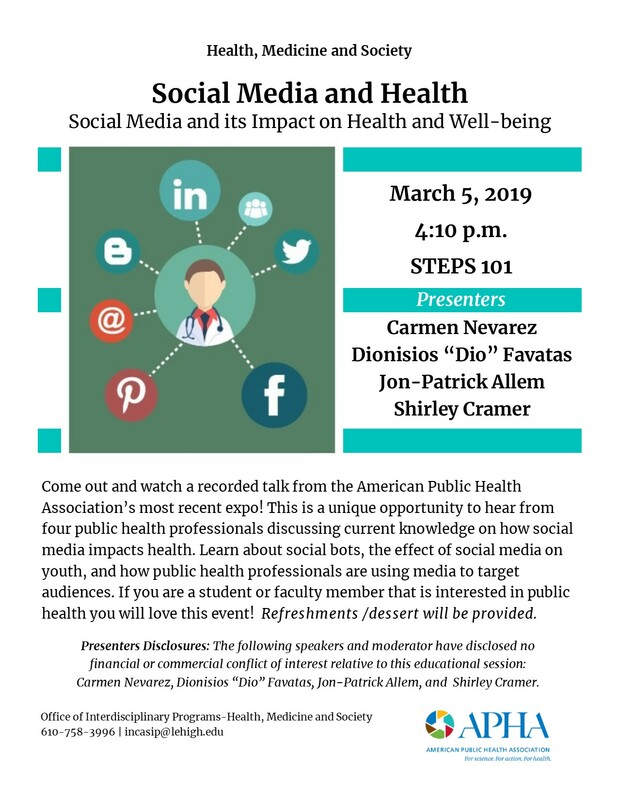 This is a unique opportunity to hear from four public health professionals discussing current knowledge on how social media impacts health. Learn about social bots, the effect of social media on youth, and how public health professionals are using media to target audiences. If you are a student or faculty member that is interested in public health you will love this event! Refreshments /dessert will be provided. Presenters Disclosures: The following speakers and moderator have disclosed no financial or commercial conflict of interest relative to this educational session: Carmen Nevarez, Dionisios “Dio” Favatas, Jon-Patrick Allem, and Shirley Cramer.